An anonymous buyer purchased a Safavid-era carpet for more than $33 million at Sotheby's in New York on Wednesday. Al-Arabiya said the price exceeded estimates by 300 percent. 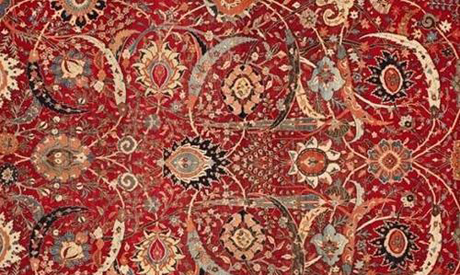 The price beats the highest price for a carpet, 'Kraman', which sold at Christie's in London for $9.6 million. The Safavid-era carpet is 2.67 by 1.95 metres, and was made in Iran 350 years ago. Iran was united under the rule of the Safavid dynasty from 1501 to 1722. The carpet, known as the 'Sickle-Leaf', resembles a Safavid portrait. It depicts plants that bloom in each of the four seasons, such as the seeds of plums and vine leaves and cypress trees. Its colours resemble the clothes of Sufi dancers, which are white, black, and scarlet, and symbolise the shroud and tomb. Such colours have been worn by Darwish dancers in the modern era. The previous collector was American millionaire William Clark, an industrialist and US senator. He acquired the carpet during a visit to Paris a century ago then donated it to the Corcoran Gallery of Art, which was established in 1869, among hundreds of works of art and rugs before his death in 1925 at 86. The Sotheby's auction included 25 rugs that were auctioned off to fund new acquisitions of contemporary art at the Corcoran Gallery.